The Gothic Revival style developed in England in the 18 th century, and was boosted in the 19 th century by the chivalric writings of Sir Walter Scott, Alfred Lord Tennyson, and Thomas Love Peacock. The Gothic Revival in architecture, combined with Romanticism, also led to the creation of the Gothic novel. By the time of the reign of Queen Victoria, who adored the fanciful medieval style, Gothic Revival had become the dominant style for country houses and the "only proper" style for English church buildings. By the 1830s, a growing taste for the romantic and dissatisfaction with the restraints of classical architecture had turned the Gothic Revival into a popular movement in America. The Gothic Revival style was popular from 1840 to 1880 for American houses, but continued as a style for churches until the 1950s. The style was particularly popular in the Northeast. 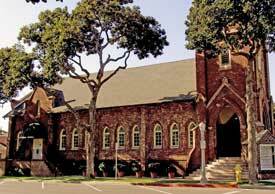 In Southern California, Gothic Revival is primarily limited to churches, especially those constructed by Episcopalians. The most expensive Gothic Revival house built in Southern California is Greystone Mansion (1928) in Beverly Hills. Many Gothic Revival structures featured tall brick chimneys, often grouped together. In California many of these chimneys, including the one on the First Methodist Episcopal Church, have been damaged or destroyed by earthquakes. Although Gothic Revival buildings were modeled on medieval architecture, none were built using medieval construction. Many in Southern California were built with reinforced concrete, although concrete was not widely used in church construction until the 1920s. Interest in the Gothic Revival style for buildings began to flounder at the turn of the 20 th century. Technical developments, such as the light bulb, the elevator, and steel framing construction caused many to see architecture that used load-bearing masonry as obsolete. Gothic Revival buildings also did not typically fit on small city lots. The style was eventually supplanted by more modern styles. Fullerton 's only Gothic Revival building is the former Methodist Episcopal Church ( 117 N. Pomona Avenue ), now the Church of Religious Science, constructed in 1909 for $20,000. The brick church exhibits many features reflecting the New England roots and the British heritage of the Methodist minister who commissioned the construction of the building. The church also reflects the preference of early Fullerton settlers for the traditional architectural styles they knew before moving west. This preference changed dramatically in the 1920s, when tastes shifted toward styles associated more with Southern California. Aldrich, Megan Brewster. Gothic Revival.London: Phaidon Press, 1994. Concentrates on British Gothic Revival architecture. Caler, Loth. The Only Proper Style: Gothic Architecture in America. Boston: New Graphic Society, 1975. Lewis, Michael J. The Gothic Revival. New York: Thames & Hudson, 2002. McArdle, Alma deC. Carpenter Gothic: Nineteenth-Century Ornamental Houses of New England. New York: Whitney Library of Design, 1978. Stanton, Phoebe B. The Gothic Revival and American Church Architecture: An Episode in Taste, 1840-1956. Baltimore: John Hopkins Press, 1968.